I just spoke with BuzzFeed on ecommerce in Africa. My thesis remains that we are not close to the inflexion point where ecommerce becomes a profitable venture. Unless you can sustain losses as Amazon did for a decade, do not venture yet. Wait for some anchors and enablers to strengthen first. The easiest way to waste money and destroy value in Nigeria is to start an ecommerce business. As I have noted many years ago in a seminal piece in Harvard Business Review, making money on ecommerce in Africa would happen but would take a really long time. I do not expect any to work till after 2023 (2022). But before then, it is putting good money in a value-destroying venture that would bleed cash until the owners give up. Ecommerce today in Africa is simply a loss-making online endeavor only people with deep pockets can do. You can be in it if you do not care for profitability. Also, you must have a double play to reduce the exposure emanating from losses from ecommerce operations [the marginal cost paralysis of ecommerce operation makes it largely loss-making). Amazon does that cleverly: as it dismantles many brick-and-mortar stores via its ecommerce operations, many run to the web for new opportunities. You know what happens? Amazon sells them cloud services through AWS. I explained in the duality element that digital products which thrive are typically both products and platforms. It would be hopeless to build modern digital products without having a moat through platforms. Interestingly, the greatest digital ICT utilities have double plays in their business models: if Amazon decimates many brick-and-mortar stores, it would welcome many online to sell them cloud services. Alibaba welcomes you to its marketplace platforms, and you certainly have signed up for its (partly affiliated) payment processing solutions (Alipay) which command commissions. So, provided Amazon can keep many flipping from physical stores to digital stores, it would make up any ecommerce loses via the cloud service business. Alibaba does the same: have a free account in my marketplace but you must use my Alipay which attracts commission for processing all transactions. Unless you have a double play in Africa, think again, as you venture right now in ecommerce. 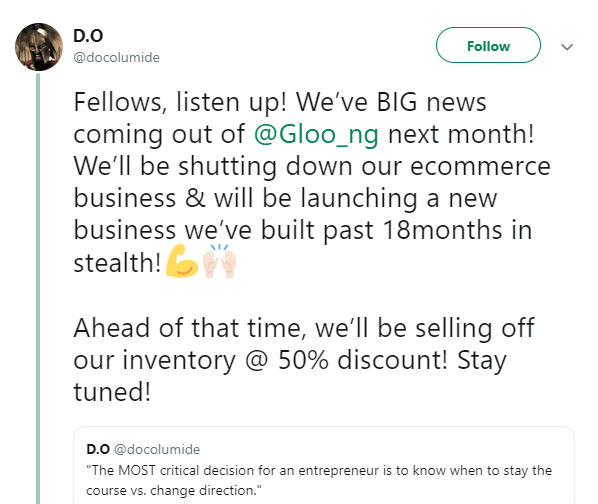 Companies like old Konga, DealDey, OLX, etc never had double play. When that happens, the gestation period to profitability via pure ecommerce operations becomes longer, triggering cashflow challenges which lead to failures. Those challenges emanate because we have severe logistics problems which must be fixed to unlock opportunities in the sector. Sure – if you have investors who do not care for losses, you can go ahead.